I've been searching long and hard for a good thrift store since we moved to Chicago. Yes, people have recommended stores like The Ark and Village Thrift, but none of them matches the low prices that I'm used to back in Boston or Ohio. I want REAL thrift store deals! Unfortunately, it's been hard to find them here in the Windy City. I blame it on the hipsters, but that's another story. Just when I was about to give up on my thrift store search, I stumbled upon the Salvation Army on North Ave (Humboldt Park). It's a huge building with three floors of hidden treasures. Major score! There's no train that goes out there, but you can easily hop on the bus or drive down...I always find street parking on the block. 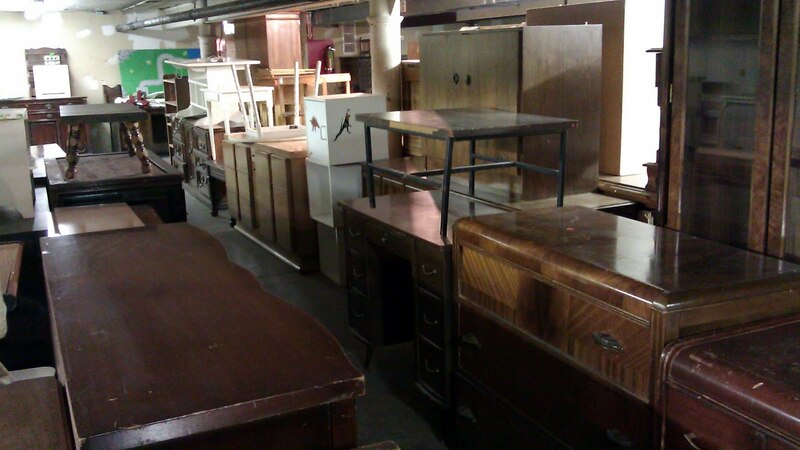 The first thing I do when I go to the Salvation Army is hit the basement. 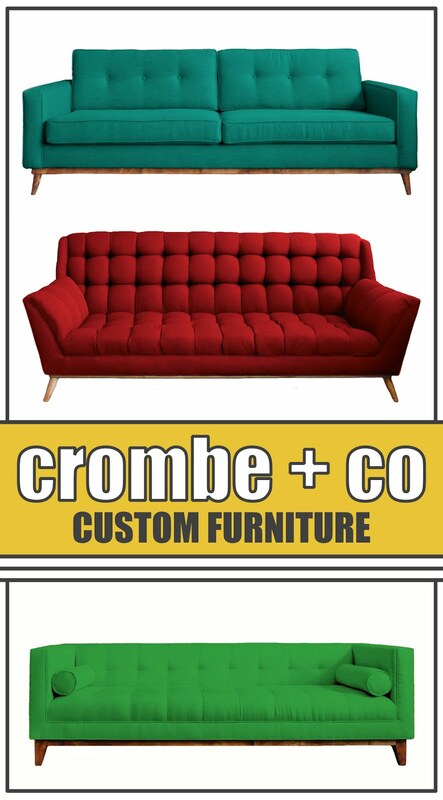 It's FULL of furniture. There are 2 main rooms each with a second room off of them. When you walk down the stairs, the first thing you notice is the smell. It's definitely not a pleasant one. Don't get discouraged, just push on because there are goodies ahead! 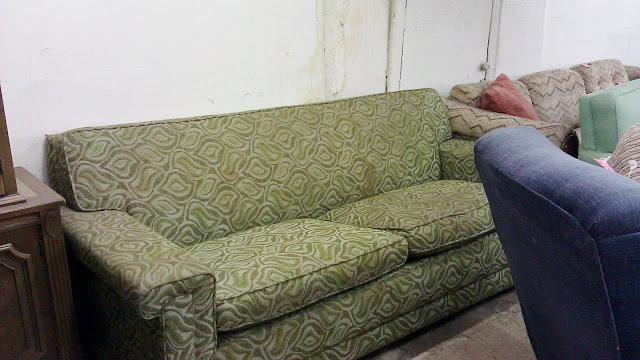 I wanted to take this couch home so bad and reupholster it but alas, our apartment is full to capacity! The first room has books, couches and lamps with a side room showcasing suitcases, large toys, and more. Keep going and you'll be in the main furniture room which features isle upon isle of furniture stacked on top of each other. Need a chair? They've got plenty. 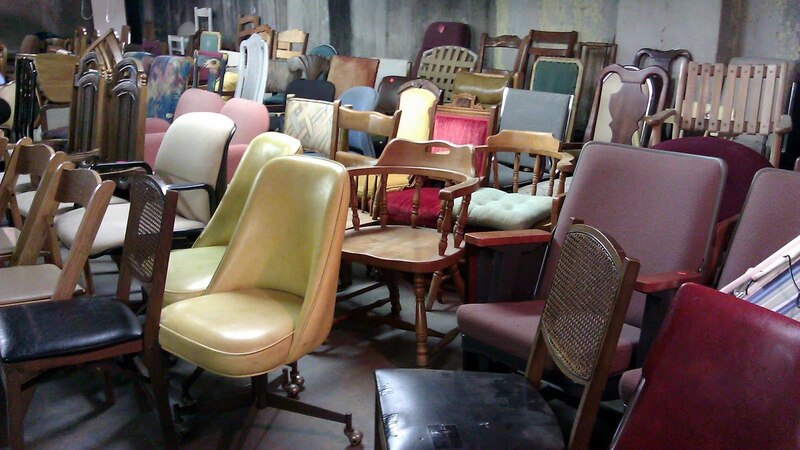 The whole back of the room is packed with every type of chair you can imagine. There's even a second side room with baby furniture, bed frames and such. Cabinets, desks, dressers, hutches, tables...whatever you want, they've got it. 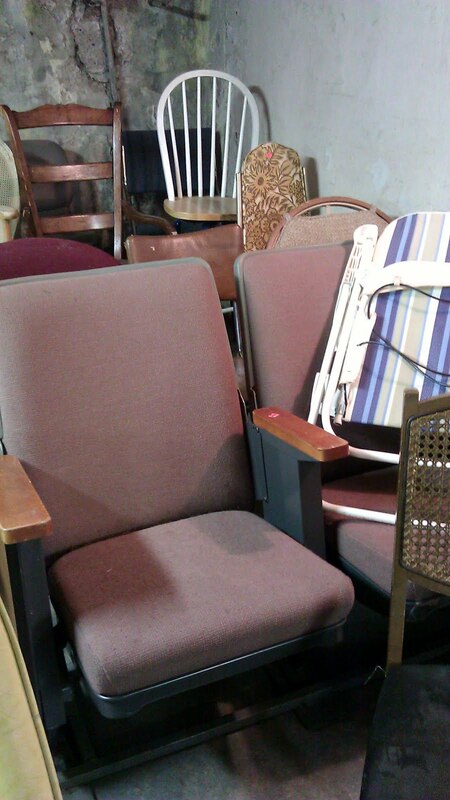 These theatre seats have been here for awhile. I wish I had a use for them. Maybe someone with a home theatre setup will take them. 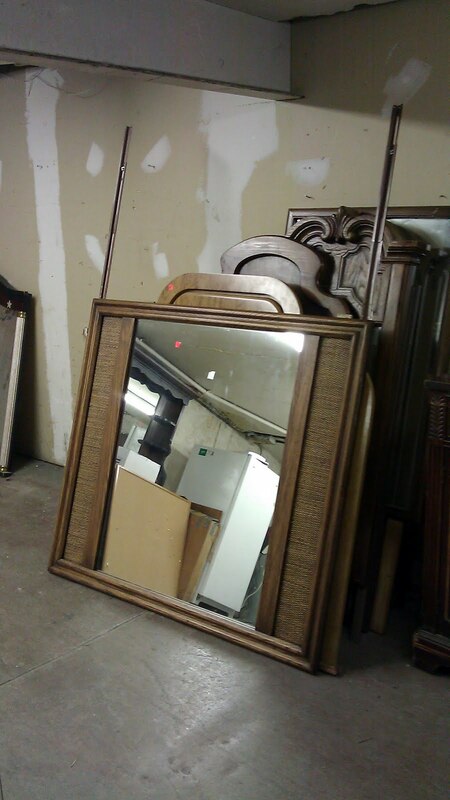 Such a great selection of mirrors. Just remove the dresser attachments from the one on top and you've got the perfect mirror. 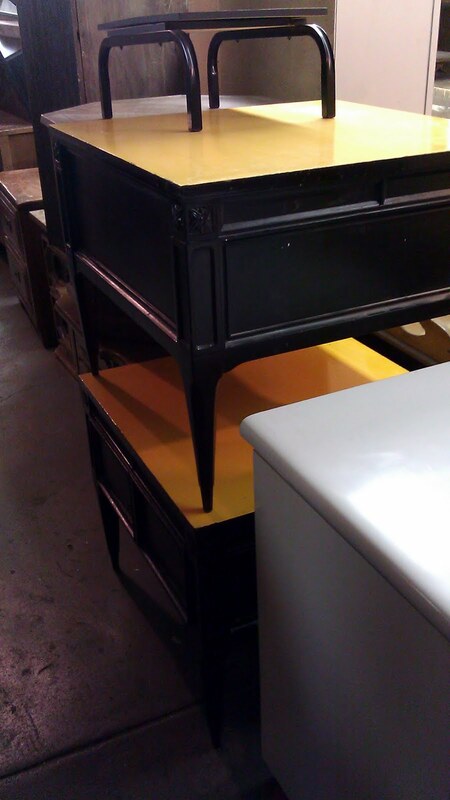 These tables are SO adorable but we don't have any room. The main floor is loaded with clothes. I'm not the most patient person so I rarely buy thrift store clothes...the time it takes to sift through the racks is dizzying to me. 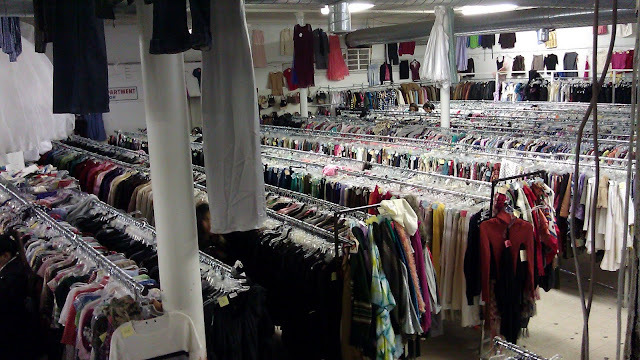 Still, if it's your thing then you'll be happy to know there are enough clothes here to keep you searching for hours! Multiply this space by 3 and that's how many racks of clothes they have here. I wish I was patient enough to look through them. The top floor is my favorite place. Here they keep all the housewares and electronics. It's not the largest bric-a-brac section I've seen, but they always have something good, like the vintage Pyrex bowl set I got this week. I still can't decide whether to keep them or add them to the store. We'll see! Unfortunately I don't have pictures of the upstairs...I'm afraid of falling through the floor so taking pictures is the last thing on my mind. I get in, and get out! DISCLAIMER 2: I have a panic attack every time I go to the second floor. Literally. I'm terrified of heights and greatly distrust physics and man-made structures. The slightest slant or weak floor board has me going nuts. While the rational side of me is sure the Salvation Army will be around for years to come, I still have a serious fear that the sloping, creaking floors that move under your feet are going to come crashing down any day now. There are ALWAYS kids running around upstairs, scaring me half to death each time I take a step. This just goes to show you how much I love the finds there...I'm willing to risk my life just for a few minutes of browsing around! What are your plans this weekend? Any thrifting or garage sales?